Do I Need a Main Relief Valve on Diesel Fire Pumps? Once you have these, you can quickly determine whether or not you’ll need a main relief valve for your diesel pump. Simply take the fire pump’s churn pressure and multiply that number by 1.21, and add the result to the maximum suction pressure you expect for the pump. If your answer exceeds the pressure rating of your discharge fittings (and it would not have if you hadn’t multiplied by 1.21), then you *do* require a main relief valve. For those curious as to where the 1.21 comes from; The pressure from a centrifugal impeller is a square of its speed. It is expected that a listed diesel-driven engine will engage an “overspeed shutdown” condition once the rated speed is exceeded by ten percent, so mathematically we have 1.10 x 1.10 = 1.21. See Figure A for an example. The fire pump churn pressure can be found in published curves from the manufacturer. They are not all the same! 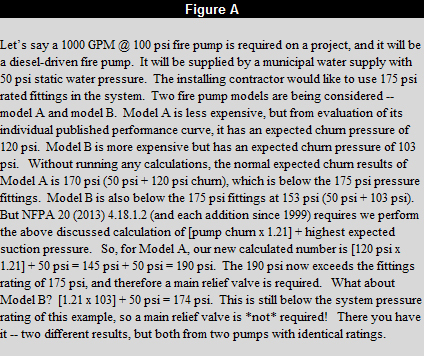 Even after performing the above math, you can easily get different results depending on the fire pump churn pressure. Don’t just assume churn pressure. Take a look at the individual performance curves. We sell an Aurora pump model with a 100-101% churn pressure, which is a tremendous help to estimators who know of its existence. We also keep a library of every certified performance curve from every fire pump we have sold so we can research and find an even higher accuracy of expected churn performance from our equipment, and go one step beyond the published catalog curves. As safety is a primary concern for us at Steven Brown Associates, we recommend going beyond just complying with the NFPA 20. Because engine overspeed safety devices frequently operate at 120% of rated speed rather than 110%, we recommend using the pump’s churn pressure multiplied by 1.44, instead of 1.21. Consult with your local Authority Having Jurisdiction for their opinion on the matter. If you’d like to learn more, or have additional questions, feel free to reply to this post, call us at the contact number below, or use our service or info request page. Posted in Q&A and tagged Diesel Fire Pump, Main Relief Valve, NFPA 20, relief valve on October 18, 2013 by admin.